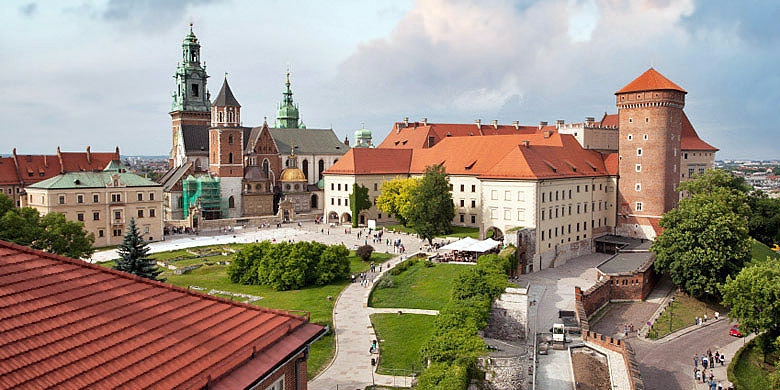 Kraków is a typical medieval city, with streets situated perpendicularly and parallel to the biggest and most beautiful market square in Europe. 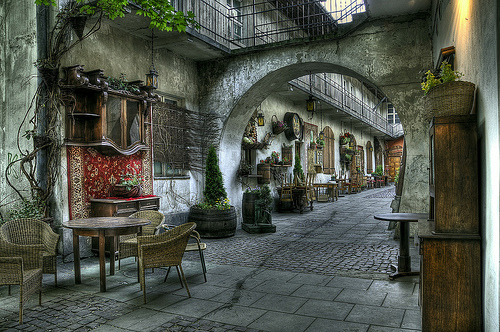 As a city left untouched during World War II, Kraków is now full of monuments. Thus the city is a great monument of European culture. Not only the medieval history is evident: in Nowa Huta, a district built in socrealistic style you can have a back-to-communism trip, visiting places, clubs and even the typical flats of those times. The really interesting fact is that in Krakow sacrum meets profanum in a very special way. There are about 120 churches with great history and about 500 clubs and pubs in the neighbourhood. It is lively and crowded with thousands of students. As we are in the old centre, it’s worth dropping in to Café Camelot for excellent cherry liquor and to go and see fabulous Camelot Cabaret on St. Thomas’ Street afterwards. If you are lucky enough you may also be allowed to see Krakow from the St.Mary’s Church tower. Going around the market square, you should go for another liquor in Bunkier Sztuki. But there is one place that shouldn’t be missed in any case: Massolit Books, a marvellous library-café, where you can sink into reading books all day long. Bored with English-language books? Then just go around the corner and find PUNKT. You will love those old cinema chairs you can buy there! What’s absolutely inspiring in Krakow is the fact that thousands of young Europeans studying at Jagiellonian University, one of the oldest universities in Europe. Krakow has an unremarkable European spirit. Although the public transport is not as comfortable as in Berlin or London and although still, unfortunately, you might have some problems at the train station in that pricy city, you will be amazed how much it’s worth its price. Nowhere else you will meet such an amount of creativity and nowhere else you will stay in a hostel run by a talented conductor that will give you a piano concert. And when you are fed up with the traffic– use a bike, the most useful and pleasant way of transport in Krakow. Here we can really feel like having Europe in our pocket. Not only because Kazimierz has lots in common with Berlin’s Prenzlauer Berg or Lisbon’s Alhama, or because standing in front of St. Peter’s and Paul’s Church makes you feel like being in Rome in front of Il Gesu or having breakfast at Les Coloures takes you directly to Paris, but mostly because here European ideas are fully supported by young people spending their free time on intercultural projects and youth exchanges. Still don’t know where to spend your Erasmus year?